The creation process of one application is simple enough and intuitive. You just need to select which application you want to generate in the applications available in Scriptcase, That it will be generated automatically. In this tab you need to select the connection that will be used in the application. 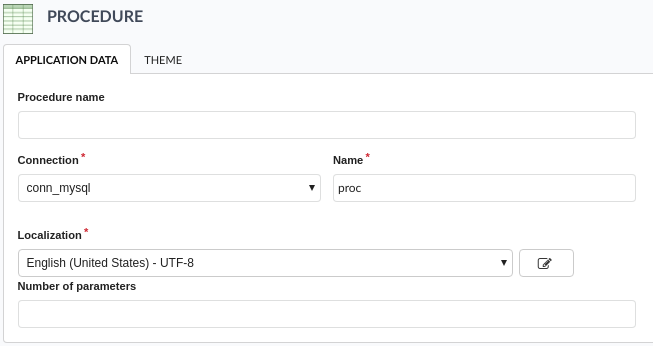 When selected the connection, you need to inform the name of the procedure that will be used and inform if it uses parameters. Procedure Name: You will inform here the procedure name that will be used in this application. Connection: Select the connection SQL Server that has the called procedure. Name: It defines the name of your Procedure application. Localization: It defines the language and charset that the application will use. Number of parameters: Informs how many parameters to be defined exists in the Procedure. In this tab we will set the parameters informed in the application creation, to be defined correctly. Parameter: It shows the quantity of parameters informed in the application’s data. Var Name: It informs the variable name to be passed as a parameter in the Procedure. Type: Selects the type of data of the parameter. Value: It defines a default value to be called by the parameter. In this screen you select the theme that the application will use. The default project’s theme, that can be checked and changed in Project > Properties, will be selected automatically. Theme - List of available themes in the project. After all the settings are done, click in the button Create. In the next screen the settings of the created application will be displayed.